I got a couple of nice returns today. 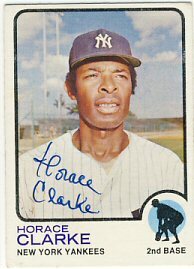 Horace Clarke signed his 1972 and 1973 Topps for me all the way from The Virgin Islands. 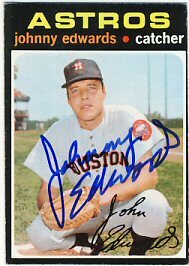 Johnny Edwards signed a 1971, 1972 and 1973 Topps and also included three signed and personalized pictures for me! Sad news today from Harmon Killebrew: He announced that he has esophageal cancer. I wish him the best. I am surprised that I haven't gotten much back in the mail lately as I still have quite a few requests out. 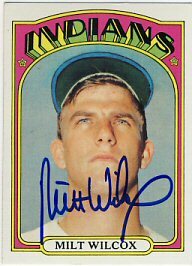 Steve, a reader of my blog and fellow sportscollectors.net member, was kind enough to contact me and let me know that he was attending a Milt Wilcox signing and offered to buy a 1972 Topps at the show and have it signed for me. I gladly accepted that offer and reimbursed him via Paypal. Thanks Steve! 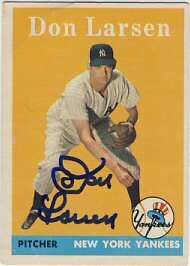 My older son received a nice return from Don Larsen, who signed a magazine as well as a 1958 Topps and 2000 Fleer Greats of the Game. 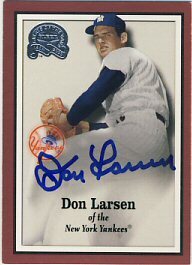 Larsen charges $15 to sign pictures and magazines and $7 per card. I'm getting very concerned about TwinsFest. They are reporting today that the Metrodome won't be fixed until March. I'm not sure what that means for TwinsFest. I guess they'll either cancel it (which is like canceling Christmas), or find another location. I don't really want to have to try to figure out the logistics of another location but I guess I'll have no choice. 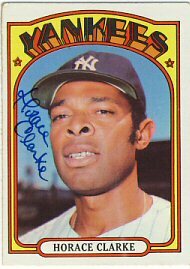 I'll have to lower my expectations and set some specific goals (Killebrew for sure) and anything else I get will be a bonus. 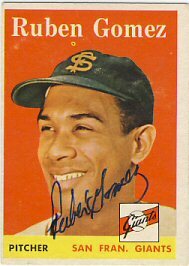 Today I received a signed 1958 Topps signed by Ruben Gomez that I bought from another member of sportscollectors.net. 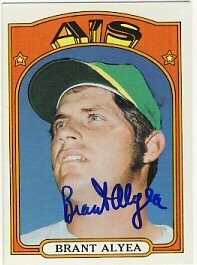 He had originally obtained it by sending it in to a signing organized by the Philadelphia A's Society in 2003. 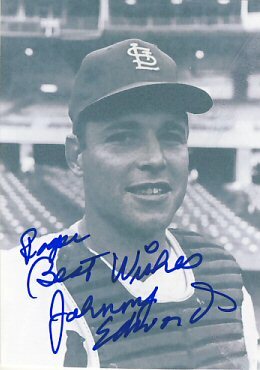 My 1958 Topps set hasn't had too many additions this year. 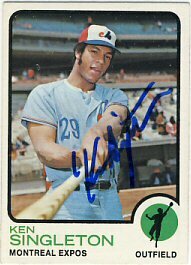 I think the only living players I don't yet have include Sandy Koufax, Willie Mays and Willie Kirkland. 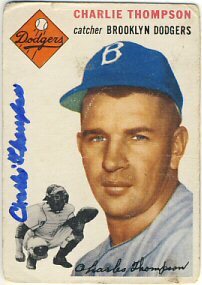 Charlie Thompson signed his 1954 Topps. 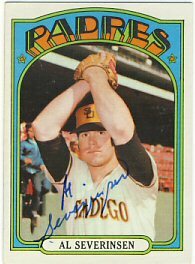 Al Severinsen signed a 1972 Topps. 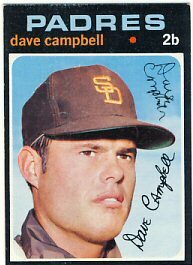 And Dave Campbell signed his 1971, 1972 and 1973 Topps. I just got all our items from the day scanned in. 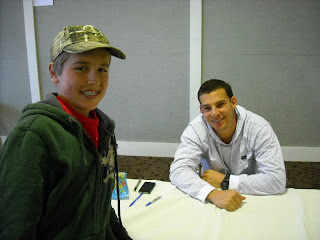 We started the day going through Danny Valencia's line. 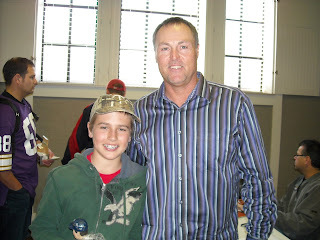 Johnny got a bat signed, and I got a bat signed for David as well as a picture for me. 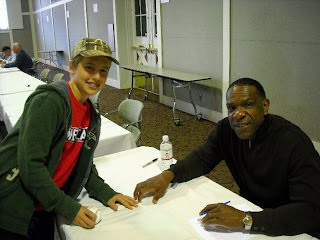 Next, we got through Andre Dawson line. Johnny got a ball signed and I got a ball signed for a friend. Finally, I got both Tom Brunansky and Gary Gaetti to sign their bobbleheads from the 1987 World Series set. 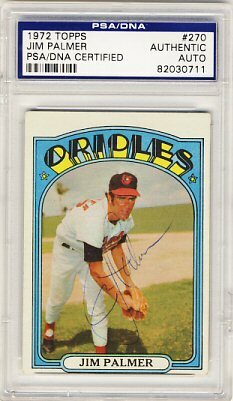 I also bought a PSA/DNA authenticated Jim Palmer 1972 Topps for $12. We had fun at the show and it is well organized. 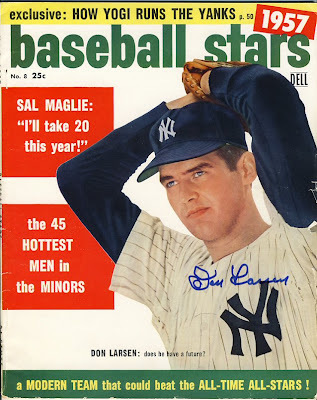 Other guests included Irv Cross, Carl Lee, Denny McLain, Al Worthington and a few others. They are going to have another show in the spring with Carlton Fisk and Joe Montana. 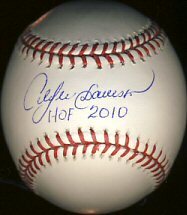 We just got through the Andre Dawson line. 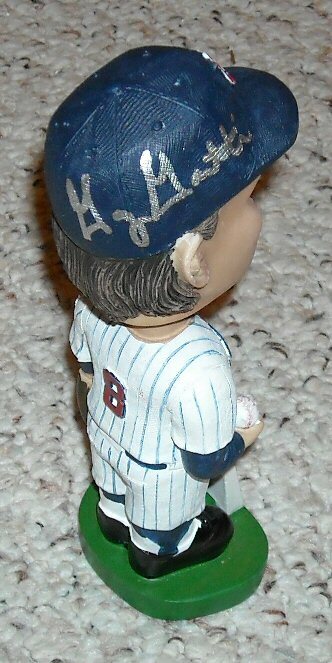 We had him sign a couple of balls with his HOF inscription. 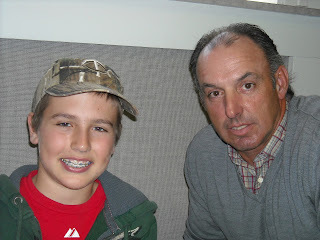 He signed very neatly and I got a great picture of him with my son. 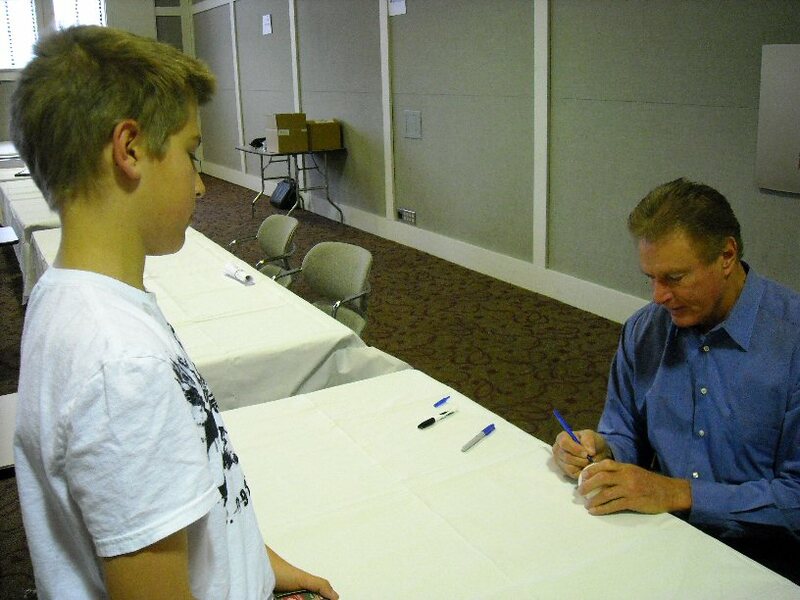 We're at the autograph convention again today. 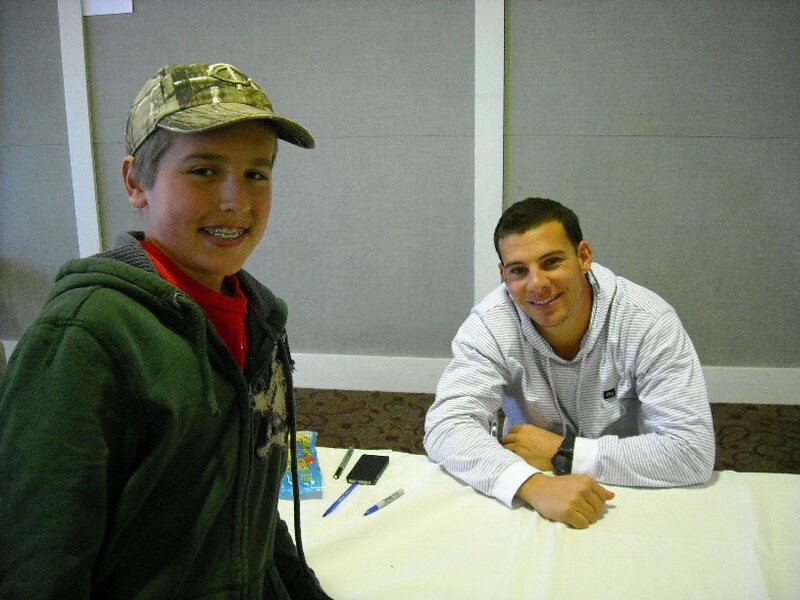 We just got Danny Valencia on a couple bats and a picture. We're waiting for Andre Dawson now. 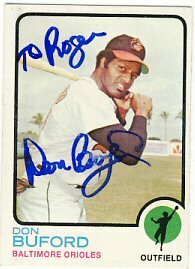 In addition to our convention today, I got a couple of ttm requests back. 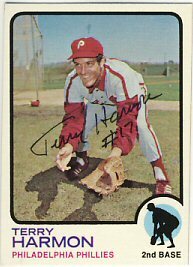 Terry Harmon signed his 1972, 1973 and 1978 Topps for me. 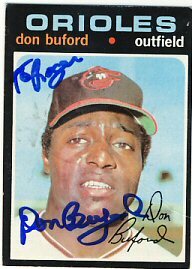 Don Buford signed his 1971, 1972 and 1973 Topps. I also had a couple of Return To Sender (RTS) today. Gene Conley and Johnny Edwards. I'll have to confirm those addresses and try again. I forgot to mention that I also bought a signed Corey Koskie picture at the convention today for $5. Here are a few pictures from today's convention. 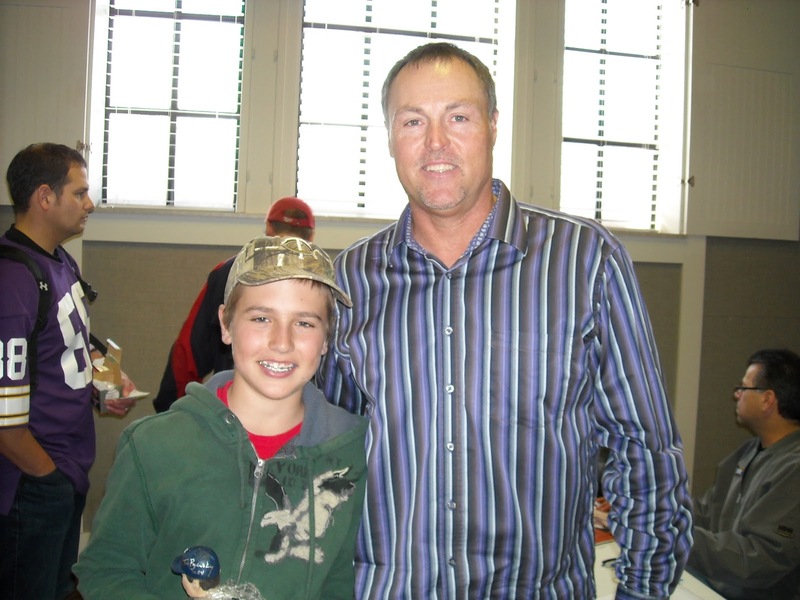 We first went through a line for Steve Carlton. His line went a little slow. The convention sells tickets with numbers on them, and you get called up in groups of 10 according to the number on your ticket. We were numbers 58 and 59 for Carlton. Carlton started signing a little after 11:00. We were done about 11:45. Then we had a little lunch and ran out to find a cash machine which took a little time. 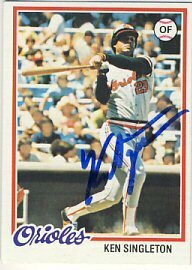 Jim Rice started signing at 1:00, and when we got back at a little after one, he was already taking ticket numbers 40-50. 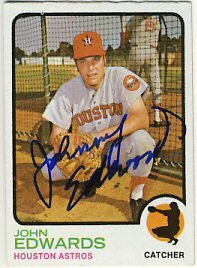 Johnny's number was in the 60's and got through the line quickly. We were probably done at about 1:20. 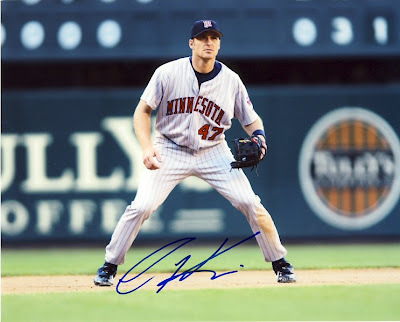 Tomorrow we have tickets for Andre Dawson, Tom Brunansky, Gary Gaetti and Danny Valencia. 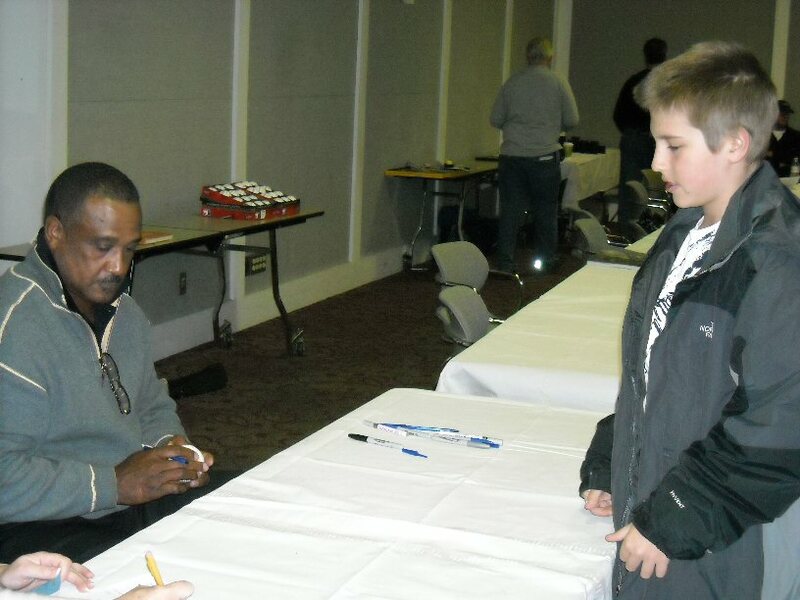 Just got through the Jim Rice line very quickly. John got a ball signed. I'll put up pictures later today. Heading home now. 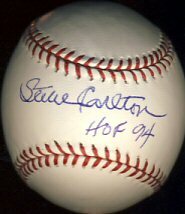 We just got through the Steve Carlton line at the Minneapolis Sports Collectible and Autograph Convention. 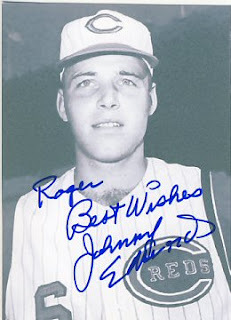 Johnny had him sign a ball with HOF inscription. I got the same for a friend of ours who can't make because he's in Cancun. Poor guy. 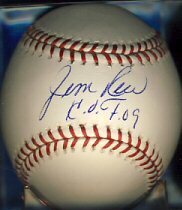 Jim Rice is next and that's it for today. 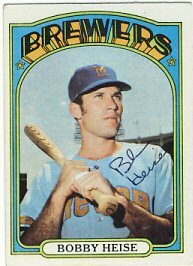 Tomorrow will be busier with Andre Dawson, Danny Valencia, Gary Gaetti and Tom Brunansky. Three more returns today. 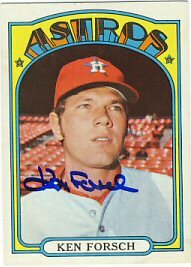 Bobby Heise signed his 1972 Topps. 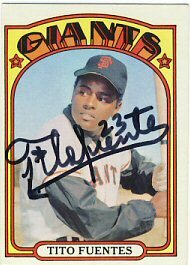 Tito Fuentes signed both his 1972 Topps for me. I enclosed $10 with my request. 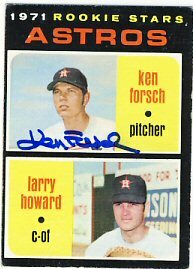 Finally, Ken Forsch signed three cards: 1971, 1972 and 1978 Topps. My older son and I are going to an autograph show tomorrow in Brooklyn Park. 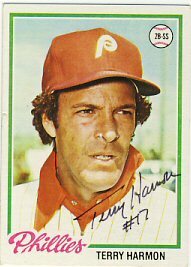 We'll be getting autographs from Jim Rice and Steve Carlton. I'll post pictures tomorrow. Two returns today. 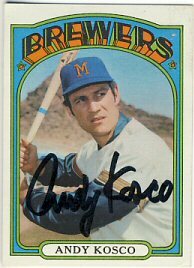 Andy Kosco signed his 1972 Topps for me. 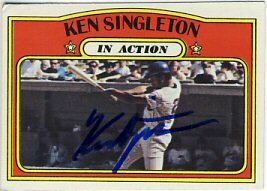 Ken Singleton signed his 1972, 1972ia, 1973 and 1978 Topps. 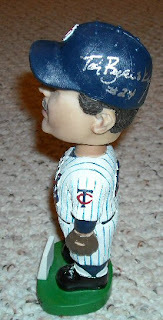 I also received my TwinsFest tickets today. I'm getting a little worried that the Metrodome won't be ready in time based on recent stories about the torn roof tearing again and being worse than they originally thought. I'm not sure what their plan B is. 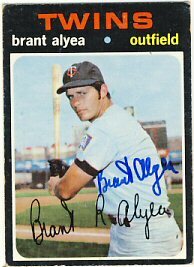 As I mentioned yesterday, I received a nice return from Brant Alyea. 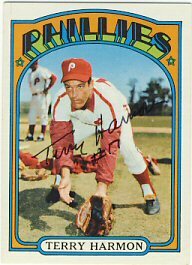 I sent him a 1972 Topps, a 1970 John Wheeldon print and $10. He was kind enough to sign both of those items and also included a signed 1971 Topps for me. 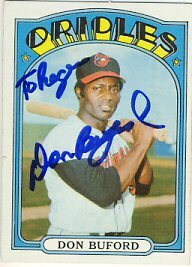 He wrote a short note answering my question about his career after baseball and noting that since I was from Minnesota, I needed a card of him as a Twin, which is why he gave me the 1971 Topps. How nice of him! 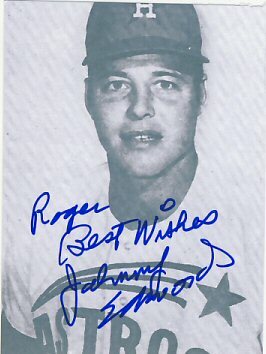 I'm pretty surprised that any players bother signing cards and returning them, much less when I come across a player who reads the letters, answers them, and even includes extras. 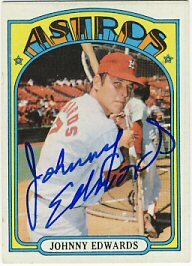 I once sent a letter to Johnny Schmitz and included 5 dollars since I was sending him four cards to sign. 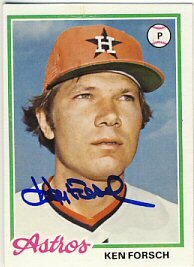 Not only did he sign those four cards, he also included 4 signed 8x10s which he sent back in his own envelope and paid the extra postage. Amazing. 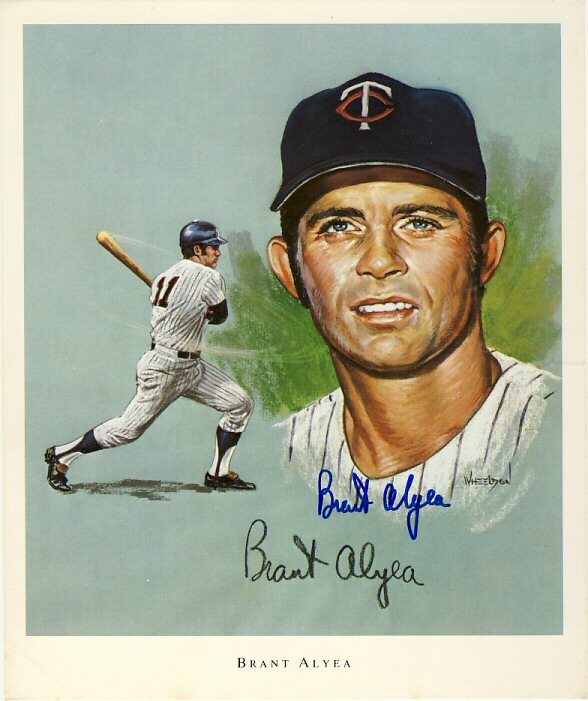 Mr. Alyea hit a home run in his first major league at bat. 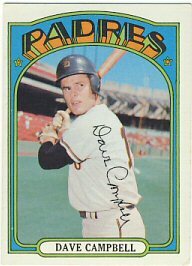 He had a great year in 1970. 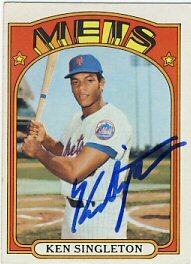 According to baseballibrary.com, he played in just 94 games and hit 16 home runs with 61 RBI and a .291 BA. I need to get going on these Wheeldon prints. 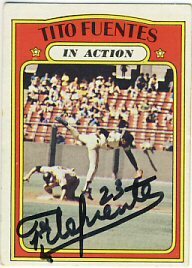 I have five of the 12 signed and can easily get some more including Luis Tiant, Killebrew (TwinsFest), Ron Perranoski, George Mitterwald, Rich Reese and Leo Cardenas. 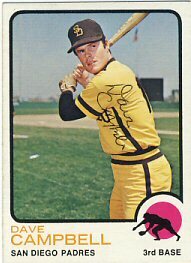 Cesar Tovar is the only one of the twelve not still with us.